This morning we turned our dining room into a Father's Day card factory. The kids worked on special cards that look like portable GPS navigation systems (only our versions are a lot cheaper than the real deal and, best of all, they are each personalized). The Brimful Dad would really like a handheld GPS for Father's Day. When or if he decides to purchase one, we'll let him pick it out himself. 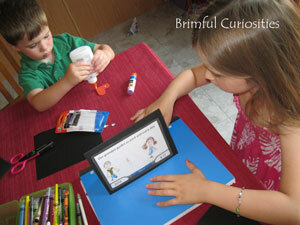 In the meantime, we're positive he'll appreciate our GPS card creation! The kids also made GPS cards for all of their grandpas and their uncle. I used Microsoft Word to create a template that looks like a car GPS for the kids to personalize. In place of the GPS map, they drew self-portraits along with a picture of the card recipient. Inside they added a heart made out of red foam paper. They glued the white GPS rectangles to black cardstock. Outside: Our [grandpa/dad] guides us each and every day. Inside: But he doesn't need a GPS ... he lovingly guides with his heart! Happy Father's Day! 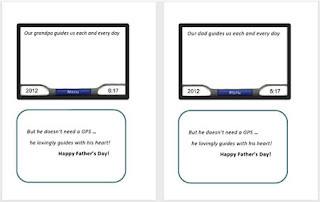 I've made the GPS Father's Day Card template [pdf] available for download from Google Docs, in case you'd like to borrow the idea. In all actuality, a GPS and a father have a lot in common. A GPS system guides the trusting user to a destination. In a similar way, a father guides his children through life with love and compassion, despite the inevitable road blocks and detours. Here's a picture book that focuses on a father who guides with his heart. Because Your Daddy Loves You by Andrew Clements is a book about a very patient and loving father. The book starts and ends with bedtime, and the little girl and her father visit a beach during the day. The dad's patience never wavers and he remains positive and cheerful, despite many mishaps and obstacles. When the little girl loses a shoe, her father helps her look, finds it, and helps her put it on her foot. When the little girl makes a mess eating her ice cream cone, he cleans her up without scolding remarks. The dad even reads his daughter her favorite story without complaint, even though it's a story he's already read several times before. He continually shows her his love through his kind and caring actions. Parenting requires an extraordinary amount of patience as Clements' book clearly illustrates. It is our job as parents to try and remain calm, guide with love and help our children grow into respectful, caring individuals. Obviously, all parents are going to have moments when patience goes out the window. In other reviews of this book, Clements has taken some flak for his overly rosy depiction of a father's parenting style and others have remarked on the "hovering" tendencies of the father. The problem with these criticisms is that it is hard to judge the age of the little girl in the book. I'm assuming that she's probably a small toddler and a toddler's abilities tend to be quite limited. They require more hands-on, nurturing parenting. My kids are getting a little too old for this father/child themed book, but I would recommend it for very small children and new dads. It's a very sweet story and the lovely illustrations by R.W. Alley are full of emotion and reassuring images. Plus, the dad isn't depicted as a supermodel, he's just an average Joe -- a little chubby and very lovable. This year Andrew Clements released a companion book to Because Your Daddy Loves You featuring a mother and son. The book was out in time for Mother's Day. Interestingly enough, the mother in this newest story, though patient like the dad, emphatically encourages independence and self-reliance. In the book, a mother and son embark on a camping trip together. The child encounters a few difficulties along the way, and the mother helps her son overcome adversity without stepping in and doing everything for him. When the boy gets lost in the store, she doesn't go rushing after him but has him follow her voice back, gives him a hug and asks him to promise not to wander off. When the boy tires while hiking, she doesn't offer to carry his backpack for him, but instead they take a snack break before continuing up the trail. The mom in this book certainly maintains a hands-off parenting style throughout the book, though she still snuggles and offers comforting support, especially at bedtime. The book is a good reminder to parents that it is important to instill in children a sense of responsibility, even at an early age. R.W. Alley's colorful watercolor, ink and acrylic illustrations portray lovely outdoor scenes set in a national forest complete with a rainbow sunset and a cozy star lit evening.